Leading paints and coatings company AkzoNobel has officially opened the world’s most advanced and sustainable paint factory in Ashington, North-East England. 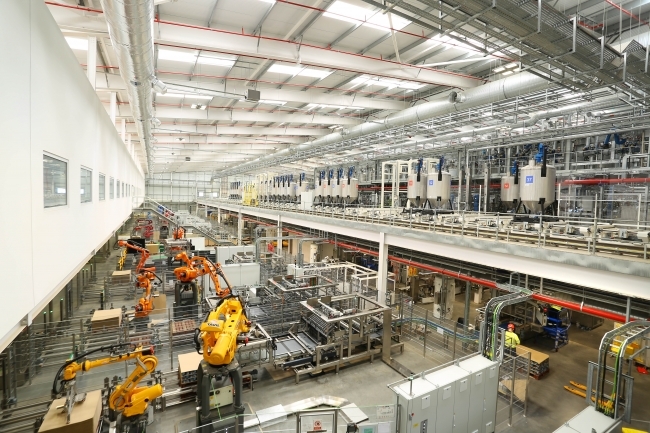 The Northumberland plant, which cost more than £100m to build, is the largest ever global investment by the decorative paints business and will become the new centre of production for Dulux, the UK’s most popular paint brand. 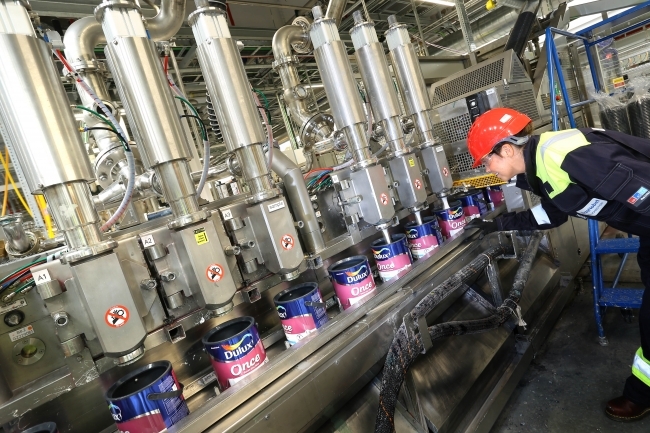 The factory will be capable of doubling current UK production levels to 200 million litres per year, the equivalent of eighty million 2.5 litre cans of Dulux, in up to 33,000 different colours, approximately enough paint to redecorate every living room, bathroom and kitchen in the UK. The Ashington plant uses a variety of renewable energy sources, including photovoltaic cells and a biomass boiler, alongside an automated manufacturing process which saves water, waste and energy. 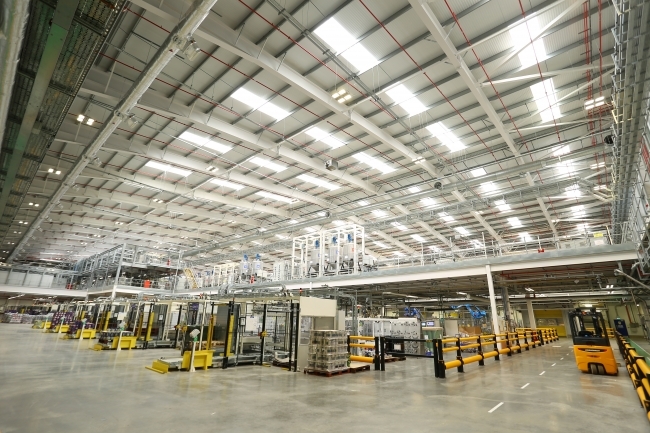 AkzoNobel estimates that the carbon footprint per litre of paint produced at Ashington will be reduced by 50 per cent compared to the facilities it is replacing. The plant secures 150 skilled jobs in high tech manufacturing for the North East whilst supporting more than 100 additional roles in the local supply chain. Covering an area of 100,000m2, the factory has capacity to expand in order to support future growth plans. The official launch of Ashington coincides with the announcement of AkzoNobel’s 2018 Colour of the Year, a curated colour palette which the company’s colour experts and global trend watchers predict will dominate sales in decorative paint markets for the coming year. The 2018 colour will be Heart Wood, a ‘grown-up pink’ that embodies comfort and ease. Heart Wood blends harmoniously with the materials from which it takes inspiration, giving consumers the freedom to balance softer shades with deeper, bolder tones. Ashington will house the second Dulux Academy, a customized training centre for painters and decorators to provide them with the expertise and know-how they need for business success. This follows the success of the first £1.4m Academy in Slough which has trained 1,600 people in its first year. AkzoNobel’s ambition is to train and upskill 10,000 UK decorators by 2020, in order to play a part in tackling the skills shortage in the construction sector, which risks limiting the UK’s house building capacity. Ashington is AkzoNobel’s second major investment in the North East, alongside its Performance Coatings plant at Felling, Gateshead, which employs more than 800 people, out of a total UK workforce of more than 3,500. Earlier this year, AkzoNobel announced an investment of £12.5 million in a technical innovation hub at its Protective Coatings global HQ in Felling in Tyne and Wear. The new state of the art R&D facility will enable more than 100 scientists to develop products in conditions equivalent to the world’s most extreme environments.